Last month, my Mom went to Disneyland for the first time! She joined us on our family trip. My 3.5-year-old had a blast riding the teacups and Dumbo with her. I can still hear their laughter and see their grinning faces as they just enjoyed the whole Disney experience. 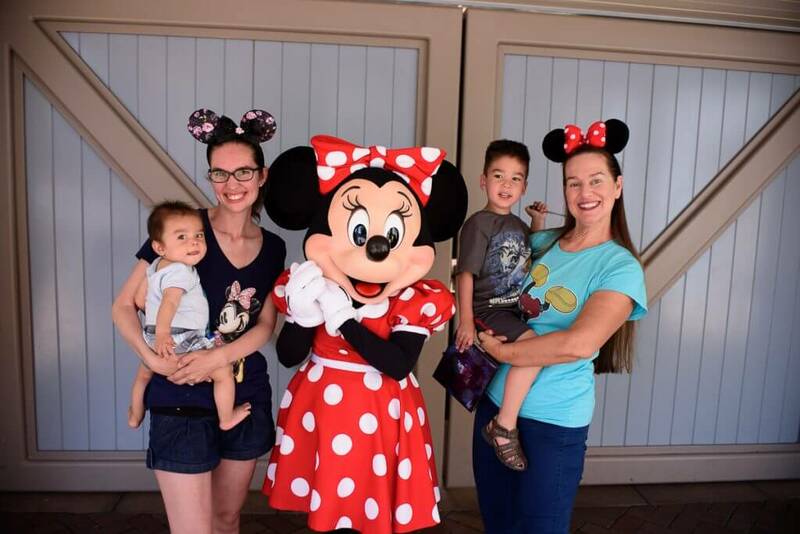 If you’d like to hear how I prepped both of them for Disneyland, you can read about it here. Now that we’re home from our fun-filled adventure, I wanted to do something to thank my Mom for all her help. My Mom taught me the importance of writing thank you cards when I was little, so I knew that was my first step. I’ve always had good luck with American Greetings cards. 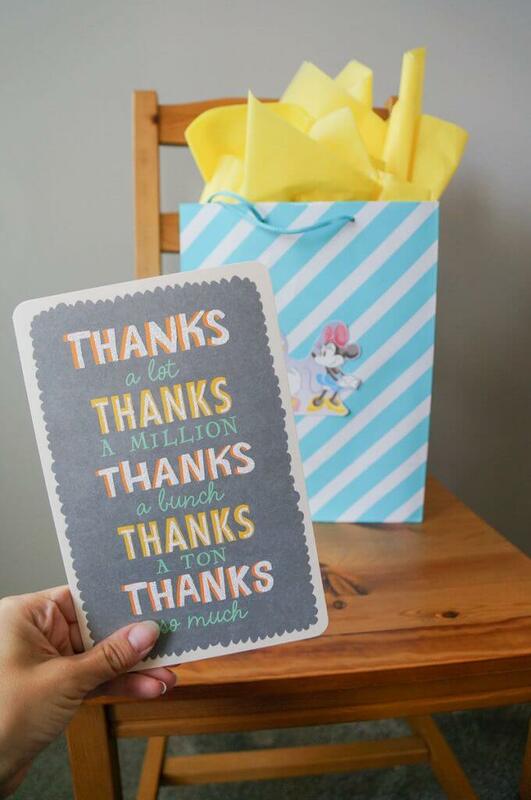 I’m not always good about saying thanks in person, but I know that a few simple words in a card can have a long-lasting impact. Traveling with small children isn’t always easy and we appreciated how much my Mom stepped in to assist our baby and preschooler during the entire trip. Therefore, my card needed something else to go along with it. Since we had so many great photos from our trip, I figured a framed photo would be a perfect addition. This was pretty difficult as we took so many fun photos at Disneyland. I ended up choosing one that featured my family meeting Minnie Mouse for the first time. It was a really fun moment of our trip! Since Minnie is a classic Disney character, I figured my collage would consist of other classic Disney characters. 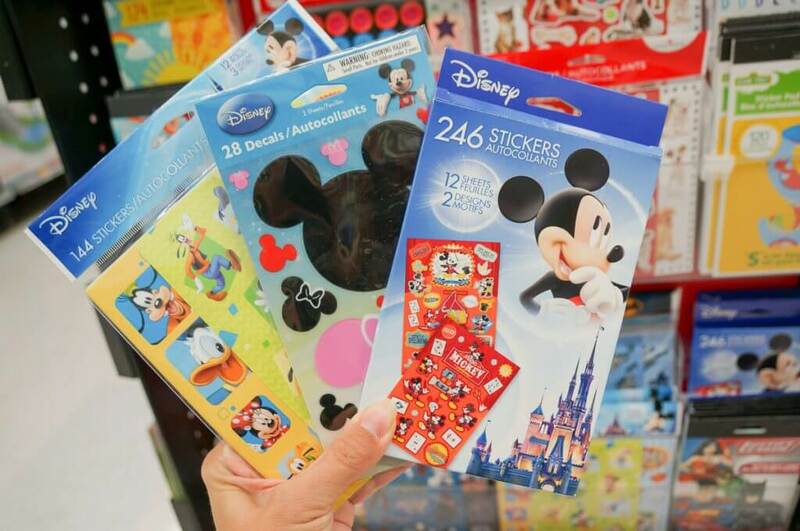 My local Walmart has an aisle of Disney-themed cards and party supplies from American Greetings. It’s easy to spot and it’s in the Celebrate! section. The first thing I did was look at the American Greetings card section. I’m pretty particular about the message inside each card I send. I want to make sure I agree with every sentiment. This means I linger a bit in the aisle while I read each one that catches my eye. This is also why I end up buying a few extras! I mean, July 23rd is Parent’s Day and July 30 is International Day of Friendship. 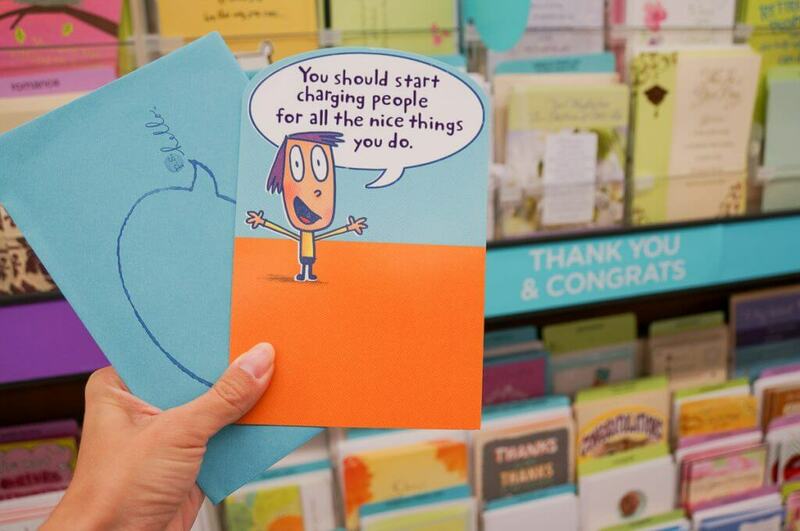 Every moment, big or small is worthy of a card. 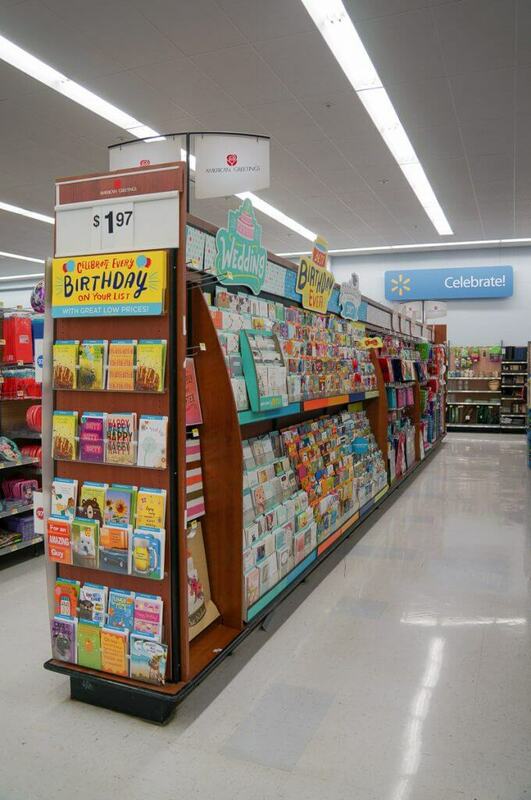 Purchase Any American Greetings® Card at Walmart and earn $1 on Ibotta. Once I picked out the card that had the perfect message to show my appreciation, I started looking for collage materials. I held my Disneyland photo up to some of the cards and party supplies so I could figure out my color scheme. I wanted to make sure my materials gave me options. 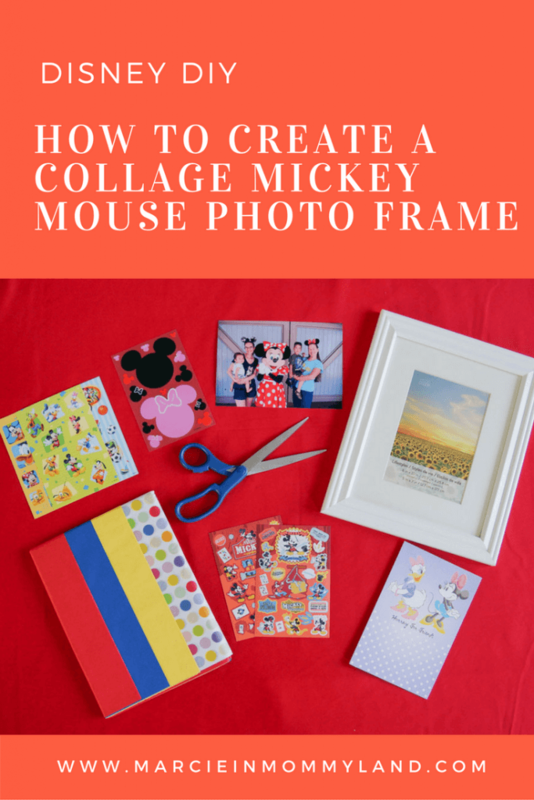 Thankfully, I ended up finding some vintage looking Mickey Mouse stickers that caught my eye and steered the whole collage. Then, I grabbed some American Greetings tissue paper and gift bag. Gently cut the tissue paper so you have an inch border around the matte board. Then, put glue directly on one side of the matte board and place it glue side down on the tissue paper. Don’t worry if the tissue paper wrinkles. You can always cover it up. That’s the beauty of a collage! I liked how the tissue paper gave me a muted red color that worked really well with the stickers I chose. 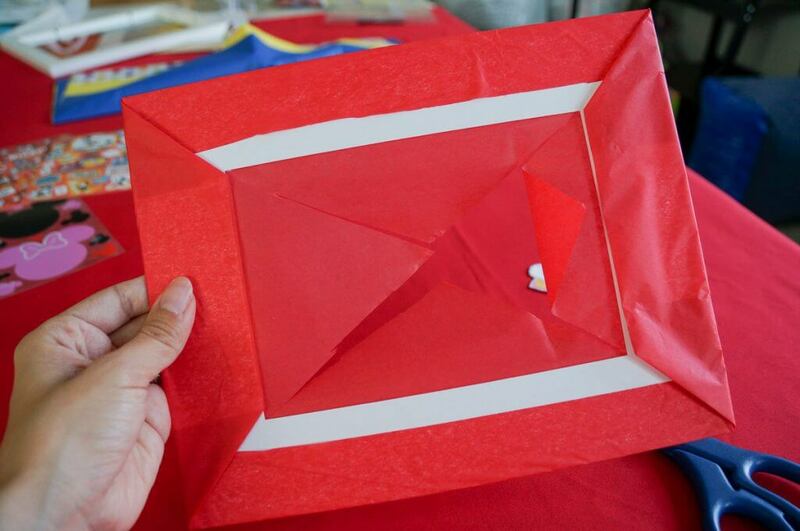 Next, cut a hole in the middle of the tissue paper and cut 4 diagonal lines to the inside corners of the matte board. It should look like an X. Then, fold each triangle and glue it to the matte board. When you are finished, the tissue paper should be covering the entire matte board. 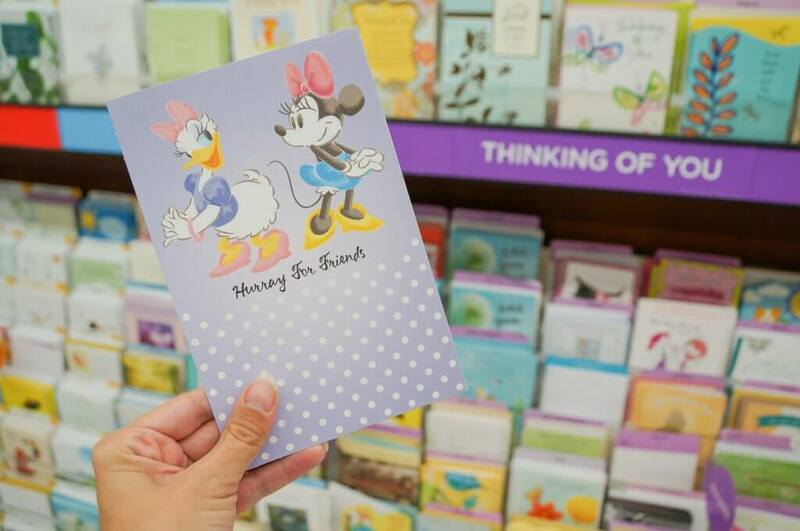 American Greetings has quite a few Disney-themed cards. These are perfect for collages. I like to use these images as my large anchor items because they are on stiff cardstock. 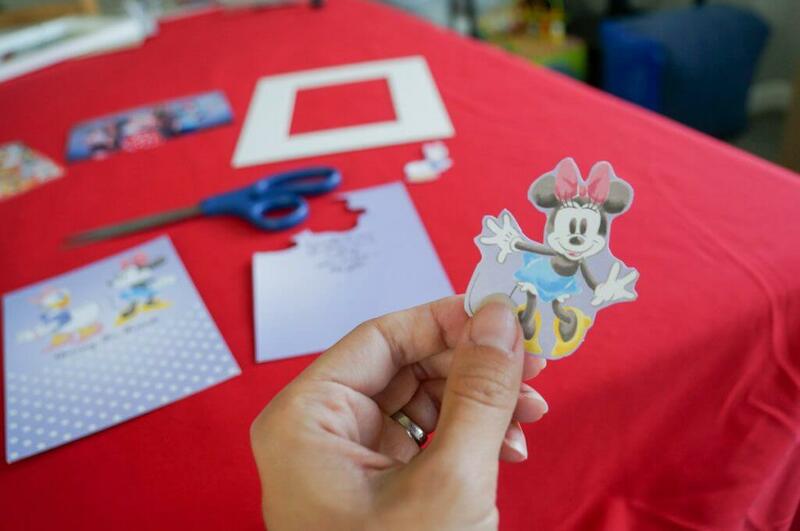 If you’re feeling extra crafty, you can cut Mickey Mouse ears out of any remaining cards or party supplies. I placed my anchor items in the inside corners of my matte board so they covered up a bit of my photo. I chose this photo specifically so I could do that without covering up anything important. Many frames will cut off the edges of the matte board. So, keep that in mind when you place your stickers. I recommend placing your largest stickers/card images on first and then fill in with smaller items. Make sure to line up your photo so it’s even before you tape. Then, put the matte board back in the frame and close up the back. Voila! 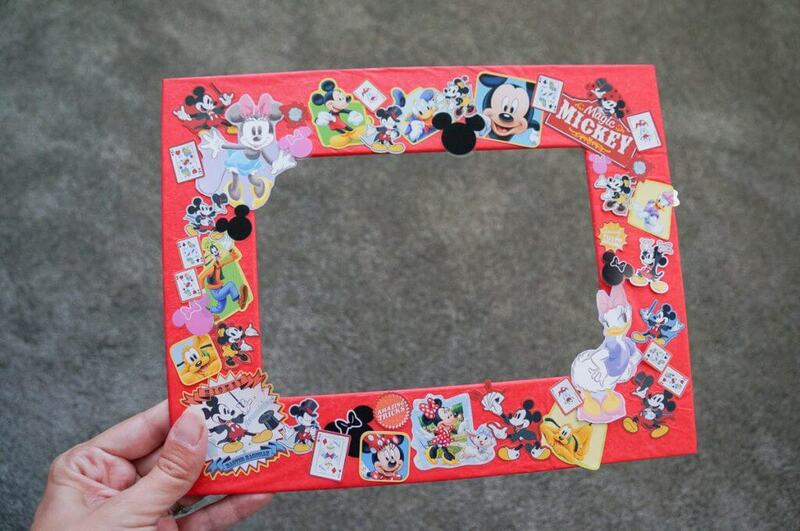 Your Mickey Mouse collage photo frame is complete! 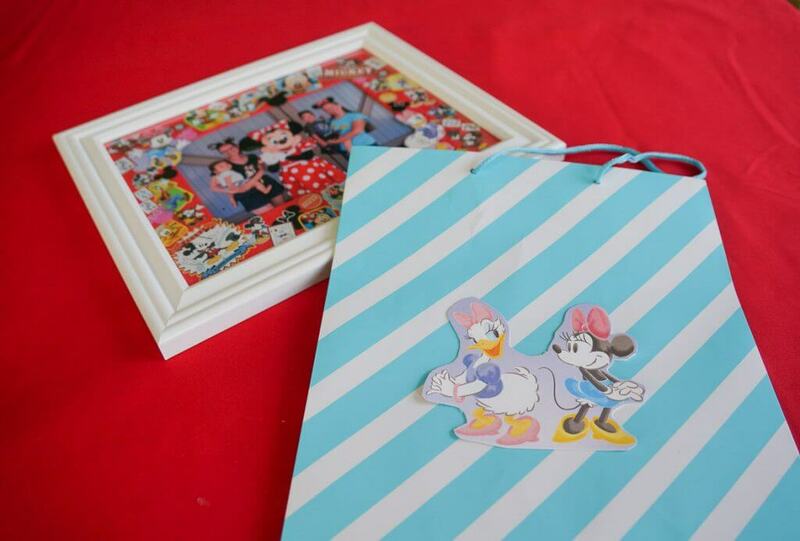 Since I only used the inside of the greeting card, I decided to cut out the cover that featured Minnie and Daisy and glue it to the front of an American Greetings gift bag. Then, I set the frame inside and added in some of the remaining tissue paper. 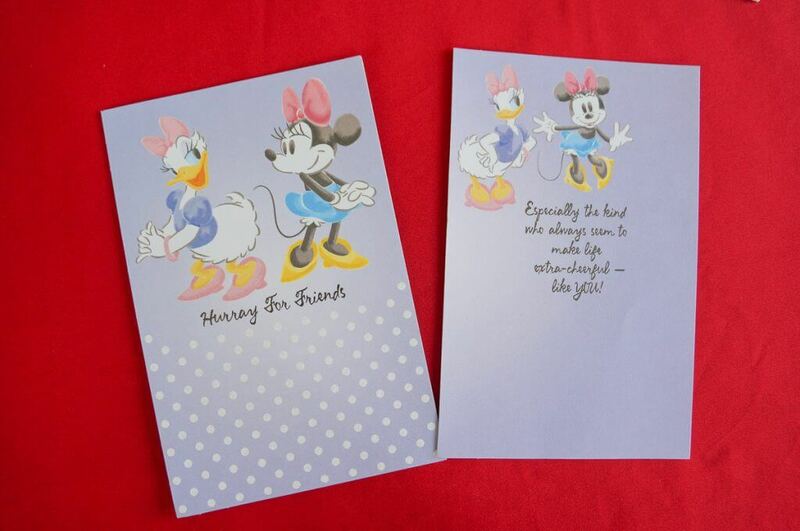 I’ve used greeting cards for other purposes too! Creative! It’s a great way to repurpose cards we get in the mail that we don’t want to throw away! Looks like fun, super cute! Thanks so much! It’s so easy! 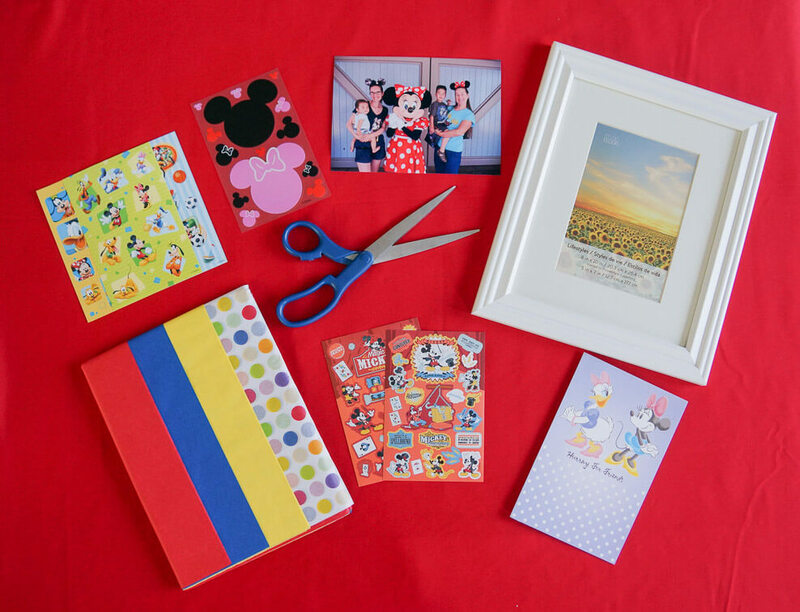 My daughter loves Mickey Mouse, but I never thought to use greeting cards as craft items. What a neat idea! Thanks! It’s a great way to re-use cards, too! Thanks! It was super easy and I’m happy with the results! Omg what a cute DIY ! Love it ! Thanks! My Mom currently has it on display and my 3-year-old is so happy about that! I keep greeting cards from birthdays, Christmas etc. and re-purpose them for various art projects . Great idea! Yep, we save all our cards! Aww… very cute. 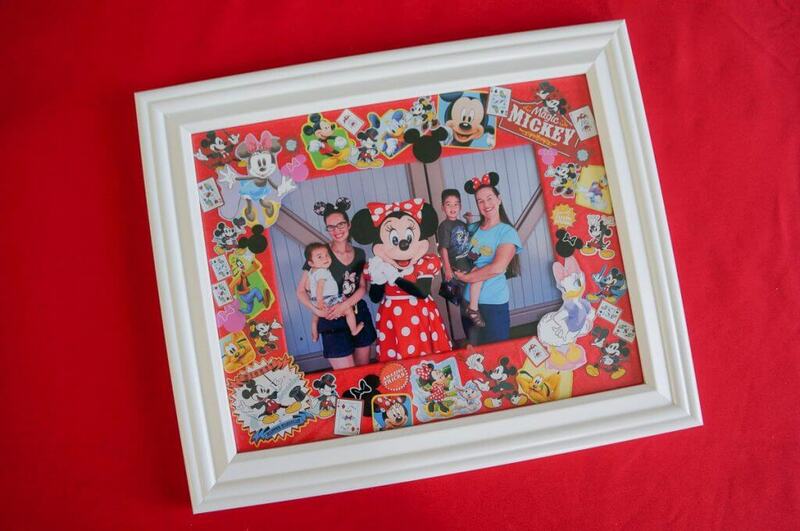 I love how can this be turned into a photo frame. Maybe I can do it with my kids and siblings. Sure it will be fun. It’s a really fun project for people of any age or creative ability. You are creative! This is cute..Can’t wait to try with my children. Thanks for all the tips and details.. They are so cute. My girlfriend’s niece will love it. Thanks for sharing! Glad to help! Hope she has a blast! Great frame and card! I am glad that you were able to find a great value at Walmart. 🙂 It is important to give thanks where it is due. I love it when cards are only $1! I also love how easy this seems to make! The step-by-step instructions and pictures help. Thanks so much! I like how it turned out! This is such a good idea! Creative and cheap, my favorites. Also, that photo is adorable! Thanks! It was a really special trip that needed to be commemorated! This is sooooo cute! I look forward to trying this out. I love this creativity! It’s giving me so much life right now haha! 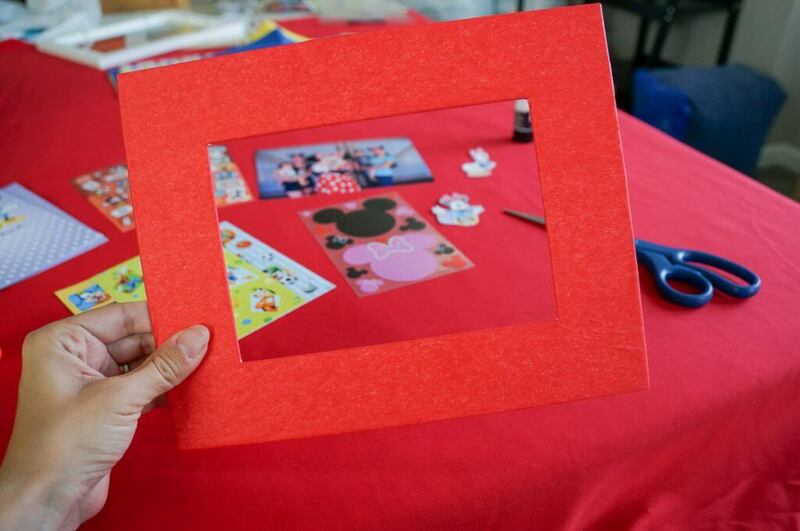 That is a super cute picture frame and easy to make. That would be a great gift idea as well. Thanks! It’s an easy project no matter how crafty you are!